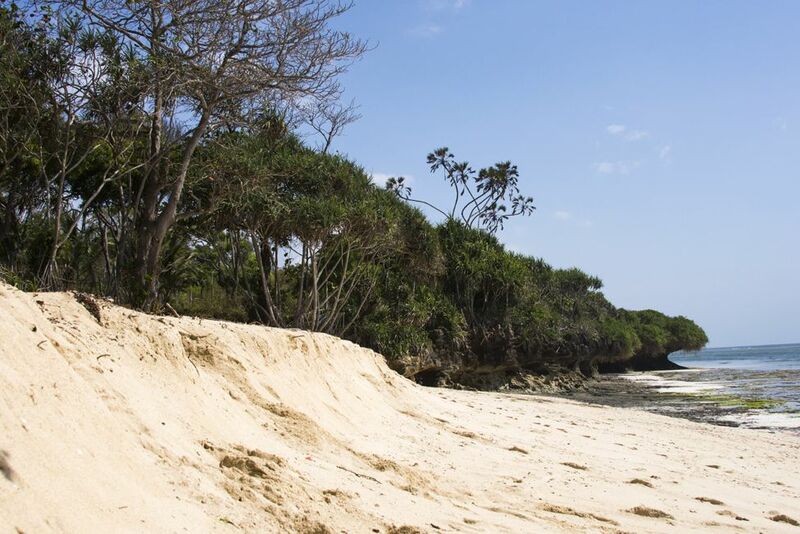 The beach in Tiwi on Kenya’s coast has suffered from offshore dredging for sand causing it to subside and begin to disappear. BBC picture. You cannot have concrete without sand. River beds are being dug up across Africa to fuel a building boom with little thought for what this means for the health of the river and those who depend on it as BBC’s Harriet Constable found in Kenya. It’s obvious when you think about it. All the major building materials – concrete, bricks, glass, are made using sand. Exploding population numbers and the knock on need for development have made sand the second most used natural commodity on the planet after water. Billions and billions of tonnes are being used across the globe. So much so that a UN report estimated global sand use in 2012 alone could have created a concrete wall 27m high by 27m wide around the equator. We need not go to the beach to be surrounded by sand – our cities are essentially giant towering sand castles disguised in concrete. The sand used for construction comes mainly from riverbeds and oceans. Desert sand, it turns out, is too smooth for the mix. Huge projects quickly exhausted Dubai’s marine sand supply, so, despite being a city built on sand, it now imports the material from Australia. The irony: sand has become such a precious commodity it is literally being sold to the Arabs. Innocent as sand may seem, the immense demand for it is causing loss of livelihoods, loss of ecosystems and even deaths. 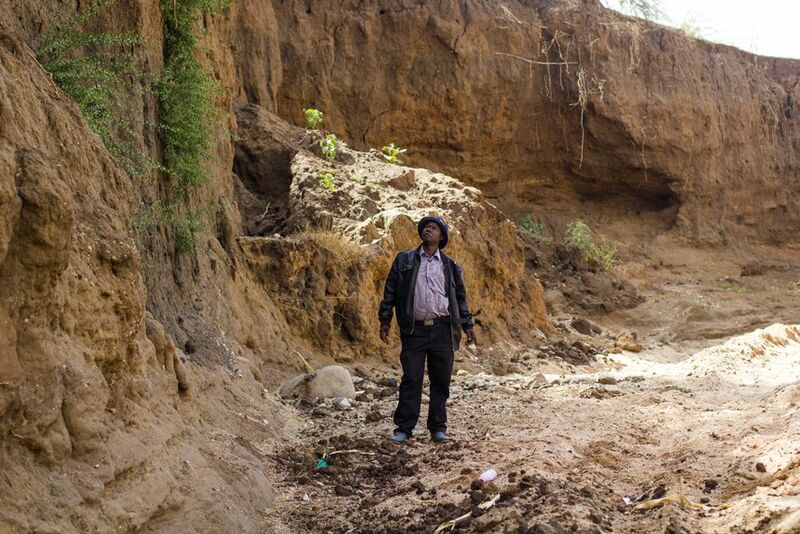 Anthony Mua stares at the steep cliffs of the Kilome Ikolya ‘dead’ river. BBC picture. With the country’s population expected to double in the next 40 years, massive infrastructure projects like Kenya’s new Standard Gauge Railway are necessary. But they need millions of tonnes of sand. Kenya’s coast and inland rivers have all been exploited in recent years, but the effect in Makueni has been particularly acute. Throughout the year, temperatures in Makueni soar to over 35C (95F). Seasonal, sand-filled rivers snake their way through the arid land. During the rainy season, water percolates through and is stored underneath. During the dry season, the population of nearly one million people dig holes in the sand to extract water to survive. However, when enough sand is harvested, only the bedrock remains, and during the rainy season the water simply rushes across it. No water is stored. I visited several sand harvesting sites across the county earlier this year. “We call this the dead river,” a local called Anthony told me, staring over the steep, reddish-brown cliff edge into the barren riverbed at Kilome Ikolya River in Makueni. A couple of years ago this river was flat. Now, there is sheer drop of about 10m from the top of the bank to the riverbed. Tree roots jut out awkwardly from the cliff face, and along the dry, meandering river, bedrock sticks out of the ground, glistening in the sunshine. “No-one can get water here now,” Anthony said. For some, sand is life, and for others, sand is money. In a poor area with few employment opportunities, the reality of what desperate humans will do is stark. Local Police Officer Geoffrey Kasyoki was well known in his community for trying to stop illegal sand harvesting in Makueni. In February 2011 he was set upon by a group of young men in broad daylight. They shot him with poisoned arrows, crushed his head and slashed his skin. 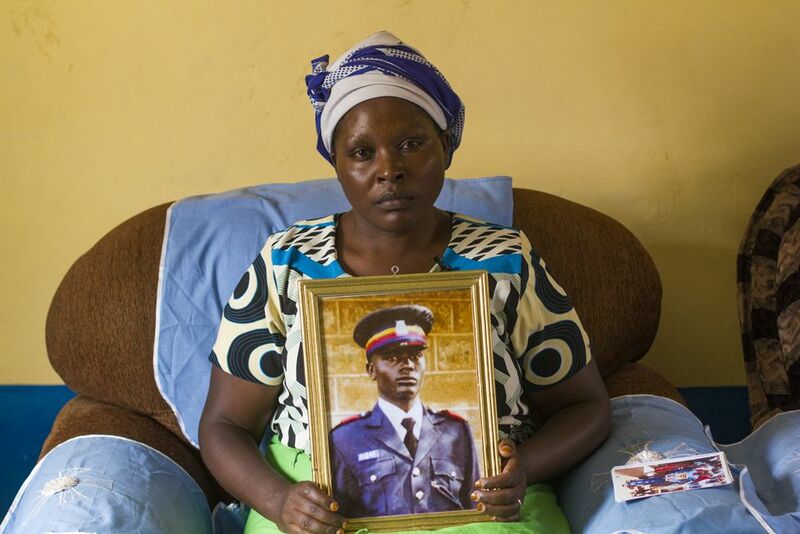 Irene Ndiku Kasyole holds up a portrait of her late husband, Geoffrey who died defending the community’s sand. BBC picture. Standing over her husband’s grave, his widow Irene told me, “He was killed to send a message to the community from the sand harvesters: do not try to stop us”. Her chest heaved in and out, shuddering with sobs, and she reached out to touch the sandy mound of earth under which he is buried. As Anthony and I walked further along the riverbed, we came across harvesters labouring under the baking midday sun, shovelling sand into a pile ready for a truck to collect it. While I watched and wondered whether sand could soon become the stuff of distant childhood memories, others around me had more pressing concerns. For them, sand could mean the difference between eating and going hungry, whether they’d have drinking water or not, or whether they’d ever see their loved ones again.